Do Art House Devotees Dream of Mission: Impossible III? Summer doldrums, as far as art film fans are concerned, means a four-month string of Hollywood blockbusters loud enough to shake beloved French auteur Louis Malle from his grave. ‘The Da Vinci Code’, ‘Superman Returns’ and a big-screen adaptation of ’80s TV show ‘Miami Vice’ soak up all the media attention. The upshot is that larger crowds at the multiplexes means smaller lines and less hassle at art house cinemas committed to truly independent programming. Going to watch director John Hillcoat’s gritty Western ‘The Proposition’ while elsewhere, mobs jostle for seats at the remake of ‘The Poseidon Adventure’, is like being a member of an exclusive club. Being part of small crowds is a badge of coolness. Still, once in awhile, everyone needs a change of pace, even the most ardent indie film buff. They crave the movie equivalent of a candy bar – a quick sugary rush. These fans want entertainment free of any intellectual engagement. They want to relive their childhood movie-going experiences. But does this mean they want ‘Mission: Impossible III’? A solid opening scene between boyish spy Ethan Hunt (the eternally youthful Tom Cruise) and Philip Seymour Hoffman’s menacing black market arms dealer, Owen Davian, leads skeptics to accept ‘Mission: Impossible III’ as a clever espionage tale worthy of the beloved TV show. But the impossible missions leading up to Hunt’s entrapment unload redundant noise, smoke, sparks, gunfire and broken glass. Writer/director J.J. Abrams, a TV it boy thanks to his popular castaways drama ‘Lost,’ shows little improvement on his less successful small screen spy adventure ‘Alias’. When it comes to spy-on-spy adventures, ‘Mission: Impossible III’ has half the spark of Steven Spielberg’s recent terrorist drama ‘Munich’. The film’s standout moments include supporting turns by Billy Crudup and Laurence Fishburne as agency administrators who question Hunt’s loyalty, British comedian Simon Pegg’s light-hearted performance as an agency techno geek and some welcome glances at Hunt’s everyday life. On the action side, highlights include a helicopter chase through a field of hi-tech windmills and a mission inside the Vatican in order to kidnap Hoffman’s arms dealer. Credit Cruise for an action man performance steady enough to keep his celebrity gossip piled outside theaters. But it’s Hoffman, Oscar winner for Capote and longtime favorite of indie film fans, who stands out as the main reason moviegoers who shun multiplexes may give ‘Mission: Impossible III’ a chance. They’ll leave unimpressed. Outside of Hoffman’s scenes, there’s little about ‘Mission: Impossible III’ to recommend as exceptional. But maybe these art house devotees will try one more blockbuster before summer ends, ‘Pirates of the Caribbean: Dead Man’s Chest’ or ‘Superman Returns’. The lesson of Hoffman, as earnestly serious as any American actor, is that it’s OK to lighten up and take a blockbuster break. Just choose your blockbusters more carefully. 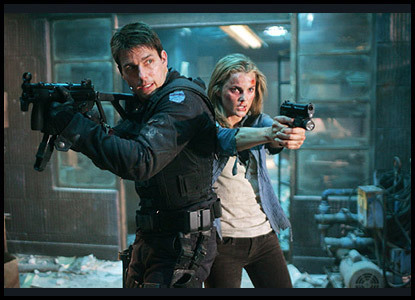 Paramount Pictures releases 'Mission: Impossible III' nationwide on May 5. 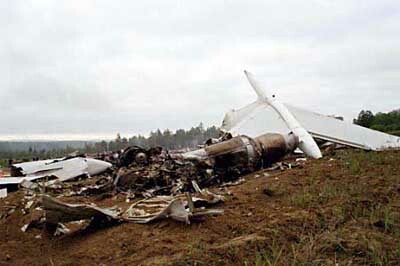 Are We Ready for United 93? The numbers say, yes. The numbers behind the weekend opening of the controversial film 'United 93' says the public is ready for a 9/11 drama as long as it’s good — $11.5 million in ticket sales at just 1,795 theaters. Break the box office grosses down to an average of $6,395 per theater and 'United 93' boasts the weekend's biggest crowds. It’s no wonder that the feedback from staff at Universal Pictures, the film’s U.S, distributor, is celebratory. They have taken a movie thought to be a hard sell and made it the first must-see, prestige release of 2006. A matter-of-fact suspense movie that recreates the events on the doomed Sept. 11, 2001 airliner in real-time, director Paul Greengrass also earned the best reviews of his career. The media can be a cynical bunch when it comes to movies ripped from current events but 'United 93' was better than all expectations. In this tale of everyday heroes, Greengrass created heart-pounding suspense without ever resorting to knee-jerk sentimentality. Basically, he’s told the story respectfully. More important than the glowing statistics are the tears shed by people exiting the theaters. I’ve overheard moviegoers describe 'United 93' as the most emotional film they’ve watched since 'Schindler’s List'. What they tell their friends and family about 'United 93', the precious word of mouth, will help determine the long-term financial and critical success of the movie. After all, a successful opening weekend pales compared to recommendations from teary-eyed moviegoers. At my first viewing of ‘The Death of Mr. Lazarescu’ (Moartea Domnului Lazarescu), Romanian actress Monica Barladeanu spoke on behalf of the documentary-like drama set in a poorly equipped Romanian hospital. Lazarescu director/co-writer Cristi Puiu refused to fly but the pretty brunette actress represented the film well in front of fall 2005 Toronto Film Festival audiences. Barladeanu’s charisma was one reason that audience members stayed for a post-screening question and answer session after the 154-minute film. More credit belongs to Puiu’s emotional drama, an artful mix of gritty realism and epic melodrama. Lazarescu is an elderly loner who drinks his nights away in the company of his cats. He accepts his vomiting and headaches as collateral damage from the latest bender. The pain escalates and Lazarescu calls for an ambulance to his cramped apartment. In a better place, Lazarescu would be on the road to relief. 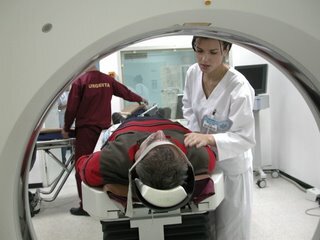 But this is Bucharest and its crumbling health care industry is ill equipped to help the dying Lazarescu. Luminta Gheorghiu brings an emotional boost as the concerned medic who accompanies Lazarescu on his death march but the film’s soul belongs to veteran actor Ion Fiscuteanu in the title role. Beneath his unshaven face and bulging belly, Fiscuteanu displays the battered spirit of a man unaware of his fading strength and the inability of the people around him to help. Fiscuteanu gives a natural, subtle performance. It’s everything the film needs. Bucharest-native Cristi Puiu studied painting and his dedication to detail is evident in every scene. Puiu’s experience making short films and documentaries explains his knack for movie-made realism. Puiu has joked about the “Romanian slowness” responsible for the film’s epic length but every scene matters. ‘The Death of Mr. Lazarescu’ is about everyday problems, told in real time, but it packs the punch of a grand epic. A hundred times more emotional than any ‘E.R.’ TV show, ‘The Death of Mr. Lazarescu’ is a medical drama worth sticking around to watch. It’s a discovery from a part of the world seldom portrayed in movies. It’s the best one can hope for from any trip to the art house. The Death of Mr. Lazarescu premiered at the 2005 Toronto Film Festival and opened in New York City on April 28. Tartan Films USA will release it in art house theaters across America later this spring.